Happiness Project#51: Cinnamon Roll Crumb Cups! Guess what, my friends. Sometimes even I mess up a recipe. Sometimes quite tragically. Enter the Cinnamon Roll Muffins that I had foolishly attempted at 10pm last night, while I was what I like to refer to as being “stupid tired.” You know that tired which overcomes you at 8pm when you’re a Mother of a 23mo Toddler, after being pulled out of bed at 7 in the morning by little hands that want to go, go, GO? THAT tired. Where I tend to just kinda loose all sense of rhyme or reason. And willpower. Must not ever forget the general lack of willpower. You hear me, Mamas? Anyhow, so last night. Cinnamon Roll Muffins. Fail. Not so much in the taste department but tragically & irreversibly in the prettiness department. To the point where I almost wanted to toss the whole batch. Until I actually tasted one of them, that is. Which, fortunately, saved this entire recipe. Because guess what? These sad, flat-toped muffins still tasted very, very good! Can I get a Hallelujah?! Hallelujah! Which got me thinking. About (my favorite) white coffee mugs. And spoons. And drizzle. Because let’s be real here, photography prettiness really does matter and can be JUST as important as the actual recipe itself. Truth. 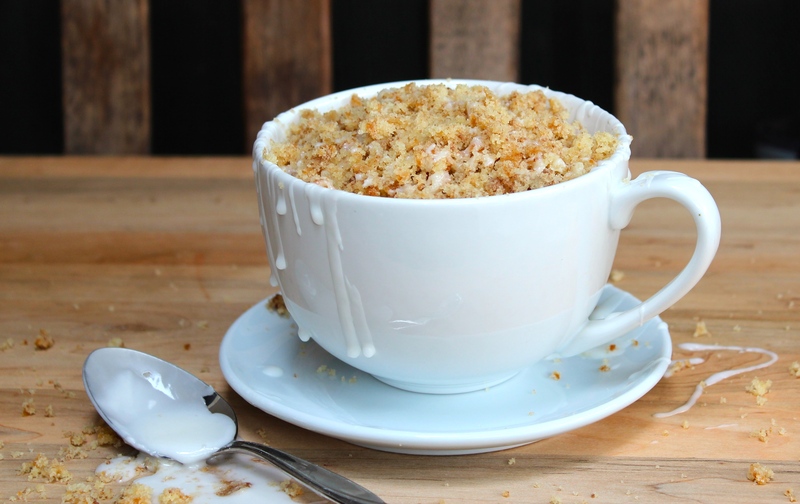 Hence, this re-invented Cinnamon Crumb Cup recipe! Which became one of the best mistakes I’ve ever made thus far in my many kitchen adventures! Preheat the oven to 350D. Butter and lightly flour a 12 cup Jumbo Muffin Pan, tapping out the excess flour from the pan. Firstly, in a small bowl, combine the fresh cinnamon and the 2 reserved tablespoons of flour. Mix and set aside. In a 2nd (large) mixing bowl, combine the flour, sugar, salt and baking powder. Whisk to fully incorporate. On a stand mixer, in another large bowl, beat the butter and brown sugar at medium speed, for a few minutes, until light and fluffy. Add in each egg, one at a time until fully incorporated, followed by the vanilla extract. Scrape down the sides and bottom of the bowl. Drop the mixer speed to a lower setting and gradually add in the flour mixture. Mix for 2 to 3 minutes. Lastly, add in the whole milk, a half cup at a time, until just incorporated. Onward to the swirly part! Using a Tablespoon, drop 2 tablespoons of the muffin batter into each muffin round. Drop in a large pinch of cinnamon on top of the muffin batter. Followed by, again, dropping in another 2 tablespoons of muffin batter on top of the cinnamon layer. Now grab a butter knife and gently swirl the batter and the cinnamon layer together. This will create a messy marbled look. Key word: messy. Pop the pan into the oven and bake for 21-23 minutes until a toothpick inserted in the muffins center come out clean. The resulting muffin tops will look slightly flatter than a traditional dome shaped muffin (due to using cake flour instead of all purpose flour). Let cool in the pan for a few minutes before gently extracting each of them onto a wire rack. Now here’s the part where I became a tad bit creative. Even though I could have just eaten up those flattened muffins as is, the photographer in me wanted something a bit more ascetically pleasing. Which meant crumbling up each muffin, with my fingertips, and then spooning those lovely crumbs into my favorite coffee mugs. Followed by drizzling each of those lovely cups of crumb with a super messy glaze. Because drizzle, people! Drizzle! How can you not have a cinnamon roll without it’s glorious sugar topping?? You. Can’t. And this powdered sugar glaze is ridiculously easy to create, too! So no excuses! To create the glaze, combine the powdered sugar and the whole milk into a medium size mixing bowl, and whisk a couple of minutes until a shiny glaze forms. And then, drizzle! Ha! So there you have it. Mix, bake, drizzle and serve. A mistake well worth anyone and everyone’s breakfast table! « Happiness Project#50: Funfetti Bundt Cake!